i’m always looking for new quick-to-make dinners, so when i saw a recipe for Skillet Chicken Chili Mac on my friend Georgia’s blog, i had to try it. i love pasta, i love comfort food AND i love anything southwestern/mexican, + since this recipe combines all three, i had a good feeling about it. not surprisingly, it turned out absolutely wonderful – as predicted, totally my type of meal. 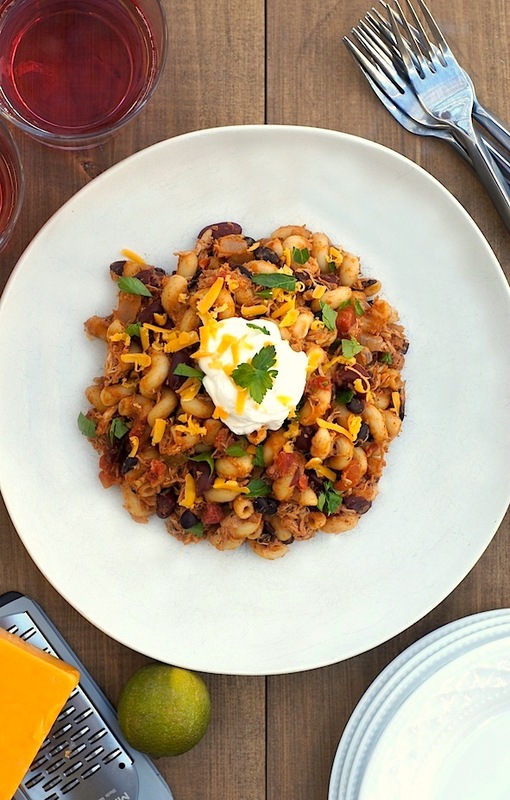 basically, what you have is a tangy chicken, black bean + kidney bean chili, cooked in a skillet with pasta + chicken broth to make an awesome, flavorful chili mac. and as an added bonus, this meal is actually pretty darn healthy – it has about 300 calories per serving, is full of lean, low-fat protein + high in fiber. you can certainly serve it as is, but i like mine topped with a little sour cream, fresh cilantro, a squeeze of lime, + a bit of shredded cheddar. so, if you’re looking for a meal that both tastes delicious AND can help you squeeze back into those pre-holiday jeans, give this a try! in a medium bowl, combine chili powder, garlic powder, cumin, salt + pepper. add chicken (either uncooked chunks, or already cooked/shredded, depending on what you’re using) + toss to coat. heat a large skillet to medium-high. once hot, add the vegetable oil to the pan, then add the seasoned chicken + onion. if using uncooked chicken, cook until chicken is no longer pink. if using already-cooked chicken, cook for about 5-7 minutes, until spices are toasted + onions are translucent. add garlic + cook 1 more minute. add diced tomatoes with chiles, tomato paste, black beans, kidney beans, + chicken broth. bring to a boil. add pasta + cover pot, stirring occasionally. cook until pasta is al dente, according to package directions. serve + top with desired toppings. enjoy! This looks like a fun and flavorful dish. I love Tex-Mex foods and flavors, so I’m sure I would enjoy this. I bet my family would love this – it looks great. I’m so glad you enjoyed this dish, Amy! It looks so delish I just might have to make it again soon! Thanks for sharing. thank *you* for the awesome recipe, Georgia! and you should make it again soon – both the husband + I loved it, both the first night i made it, + as leftovers the following days. so good! I sort of want to put a fried egg on this and have it for breakfast. Ooh, i loooove the way you think! This looks like such a tasty and easy meal to throw together! I love the chicken, spices and pasta that it calls for! Love this! 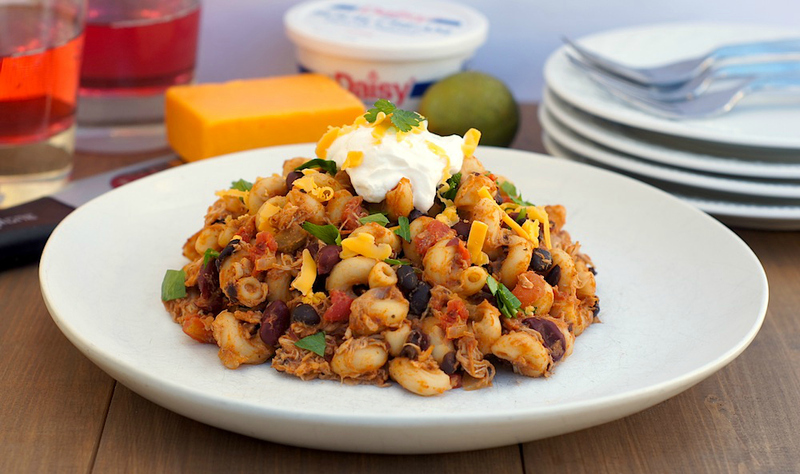 We are huge fans of Southwestern food so I know this is going to be a huge hit! Hope you had wonderful Christmas, Amy! I did! I hope your family had a great Christmas, too, Anna! Yes, yes and yes. You’ve combined all of my favorite things into one gorgeous meal. And I’m with Jackie on the runny yolk! the leftovers are amazing – they get even more flavorful after a day or two in the fridge. mmmmm. I am so there with you…pasta, comfort, mexican..yep yep yep…can’t wait to try this! Hope you have a Happy New Year! Oh this looks so yummy! I am on the hunt for healthy after this month of total over indulgence! Thanks for sharing Amy! Ahhh…all your comfort food pasta dishes make me swoooon! Love the southwest/mexican twist! yum!! you had me from the beginning, but you totally hooked me with the fact that this is even remotely healthy. i was going to make it anyways, but now i *have* to make it haha! bahaha, i felt the same way when i read the original recipe! i was going to make it regardless of how healthy it was, + the healthiness factor just made it even better! This sounds really tasty, so flavourful and delicious! Oh mama. I want to come over to your house for dinner. oooooo yes, yes, and YES! Happy New Year, Amy! I’m so far behind with everyone since starting my new job this fall! wanted to wish you a very happy (belated) holiday season, dear friend! 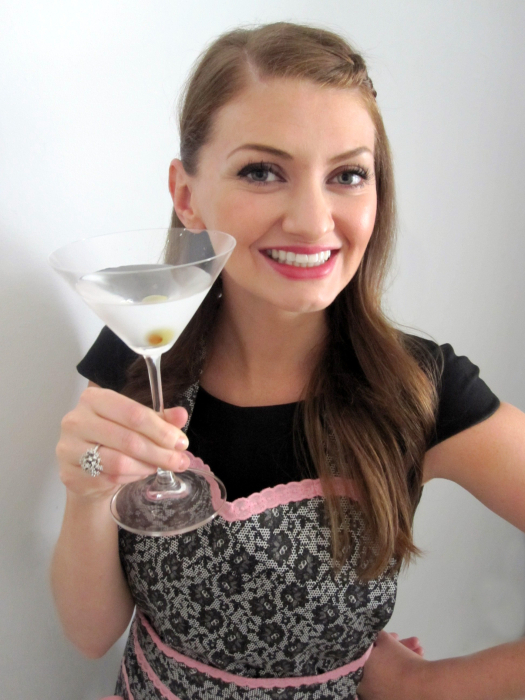 here’s to a fabulous 2013…and this dish is a great way to kick that off!! Wow Amy!!! Seeing your pictures and reading your blog makes me realize how much I’ve missed American food!! It’s crazy how certain ingredients are just so impossible to find here! like CHEESE!!! There doesn’t seem to be any variety of cheese at all Take care and Happy New Year to you!! Congratulations on not making this look like… you know. Very nice job! Happy New Year’s Eve, Amy! Bahaha, he would be mighty happy if I just wanted to make fried chicken all the time, too – it’s one of his favorite foods. =) Happy New Year’s Eve to you, too! I saw this while we were on vacation in Florida, and I went out and bought the ingredients today! It will be dinner tonight! Thanks for the idea … I’ll let ya know how it turns out! awesome, i can’t wait to hear how you all like it! This recipe looks awesome – I know it would be a hit with everyone in my house! Perfect for a day like today – we’re getting snow here. Have a wonderful New Year, friend! always looking for new mexican meals! this sounds great!! This looks so good, Amy!! I love Georgia’s blog too! This looks delicious Amy and I love that you can cook it all up in once big skillet! I’m pretty sure my kids & hubby would love this too. Hope your new year is off to a fabulous start! Amy, when can I come over with my fork? Hehe. This one looks delish! Can eat this forever…ok, maybe not. I need a big giant fork right now. This has it goin’ ON!! This looks amazing! + I’m almost positive Eric would literally lap this one right on up…and then request again in the future. Definitely added to my must-make list! I hope you had a wonderful holiday season! Happy 2013! Oh yeah! I remember seeing this on Georgia’s site – now I am drooling all over again! Totally craving this for dinner now! Happy New Year, Amy. This is making me hungry right now! With so many flavors that I love, this dish sounds great!